Pushpi Weerakoon meets youth in a Rotary-sponsored gathering. Sri Lanka, the home country of several graduates of EMU’s conflict transformation program, is emerging from three decades of civil war after the Sinhalese-dominated government’s brutal defeat of the Tamil-minority insurgency in 2009. The words “peace,” “reconciliation,” and “pluralism” are known throughout the country, but bringing these conditions to fruition remains a hope and a dream. One of the people at the forefront of making them a reality is an energetic graduate with multiple degrees, Pushpi Weerakoon, MA ’11. In October 2011, five months after finishing her degree at EMU, Sri Lanka President Mahinda Rajapaksa named Pushpi the coordinator of the Sri Lankan Reconciliation Secretariat. 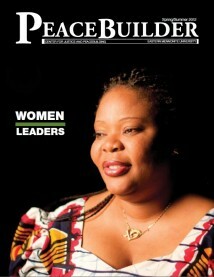 In an interview posted on December 19, 2011, Pushpi explained that her office had no actual powers, but was mandated to advise, guide and facilitate dialogue and other moves toward reconciliation. Online photos of Pushpi at work in Sri Lanka suggest that she is often outnumbered by taller, older men in her meetings, yet she appears unintimidated. Soon after her appointment, Pushpi invited representatives from non-profits like Save the Children, Rotary and other civil society groups to meet with government officials to explore ways to integrate ex-combatants and promote respect and equality for all religious and ethnic groups. “In simpler terms, it’s about bringing people together to move them beyond the past through reestablishing trust and normalcy, [and] forgiving each other,” Pushpi said. She pointed out that such trust requires a legitimately just society based on mutual respect among ethnicities such as the Sinhala and Tamil, as well as among different fractions of single ethnicities such as the northern and southern Tamils and Muslims. “All communities should accept ex-combatants/beneficiaries, military and the police, war widows and disabled into their localities with open arms. There should be a positive atmosphere for the natural day-to-day activities to progress without fear and prejudice. Pushpi spoke of convening meetings of officials in education, health, agriculture, the military and the police to share their concerns and explore solutions. As a direct result of these meetings, she rallied contributors—Rotary members, private computer companies, foreign colleges and Sri Lankans in diaspora—to refurbish a rundown building to house an educational and vocational training center that will serve ex-combatants, among others. Pushpi also called attention to the urgent need for “safe houses for young unmarried mothers, education on sexual and reproductive health, and income-generating activities for war widows,” in addition to more English and math teachers, vocational training for youths, and extracurricular activities and cultural exchanges in the schools in the language of each population group. 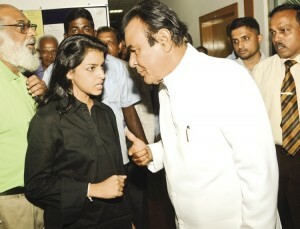 Pushpi Weerakoon shares her thoughts with D.M. Jayaratne, the prime minister of Sri Lanka. Pushpi has frequently turned to fellow Rotarians in Sri Lanka to provide the funding and volunteer assistance necessary for many of her initiatives, such as exchange programs between ethnically diverse young people living in different areas of the country. She was a Rotary Peace Scholar in 2007, Rotary Ambassadorial Scholar in 2009, and National Peace Award recipient in 2011 from the Rotary Club of West Colombo. In 2009-10, Pushpi combined her master’s degree studies at EMU with mediation training at Harvard Law School. She holds an undergraduate law degree from the University of Buckingham and an MBA from the University of Cardiff, both in the United Kingdom. She has a diploma in conflict resolution from Bandaranaike Center for International Studies in Sri Lanka, which is affiliated with the UN’s University for Peace in Costa Rica. One Response to "Sri Lankan Rotarian Heads Reconciliation Efforts"
I am making a research paper regarding integrating ex-combatants into society.If you can help me I am really thanks to you.